As long as you continue to try something new on your Tango, there is a good chance for you to explore your possibility in your body and you will find something works on your body and help you to break through to another level. 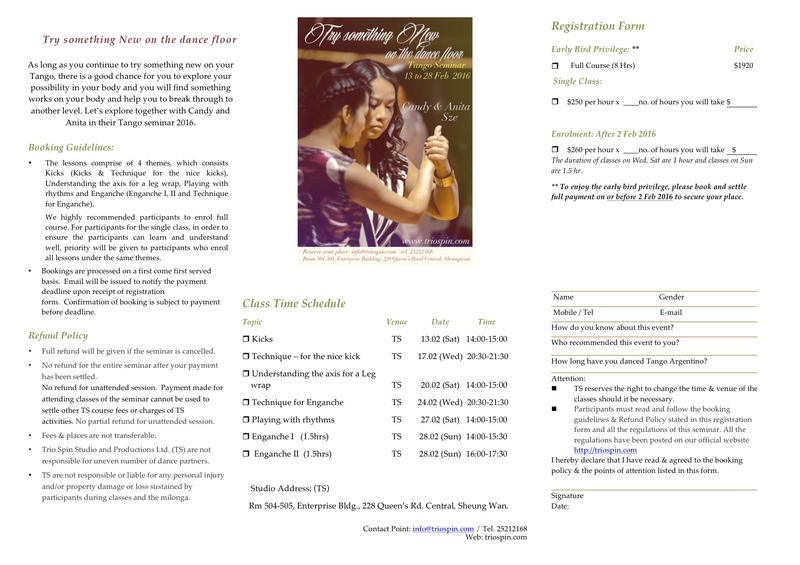 Let’s explore together with Candy and Anita in their Tango seminar 2016. Enganche (Enganche I, II and Technique for Enganche). We highly recommended participants to enrol full course. For participants for the single class, in order to ensure the participants can learn and understand well, priority will be given to participants who enrol all lessons under the same themes. To enjoy the early bird privilege, please book and settle full payment on or before 2 Feb 2016 to secure your place. Please download the enrolment form here!